Glory revolves around the women’s hockey team in the 1930s. She not only researched and wrote this play—about a women’s hockey team in small-town Ontario during the Dirty Thirties—she is also the choreographer for this work about life on and off the ice. “In this circumstance, I wrote it but knew how I wanted it to move. I wanted the hockey games to come to life so I did it through dance,” Power says. The story revolves around the women’s hockey team in the 1930s. They’d started out as softball players and were looking for a winter sport. Two sets of sisters started the hockey team. “It’s about their determination and fight as a group to become a team, learn to play, and to become the best in Canada. And within that, we also have the personal stories of the women on that team at the time,” says Power. They were not easy times for anyone, let alone women struggling to get by in the hungry Thirties, as the threat of the Second World War loomed. 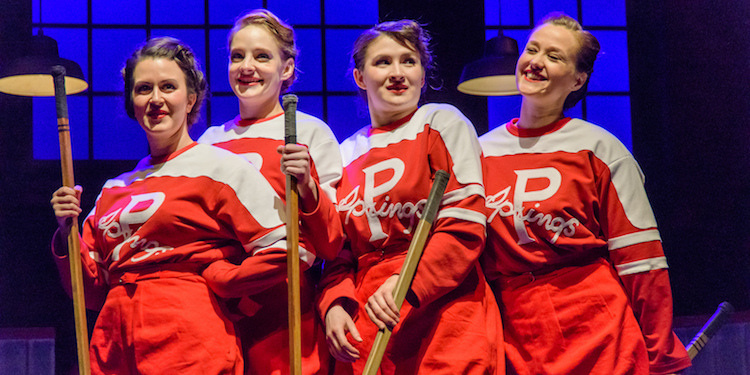 “I wanted it to be a play about a hockey team and the women on that team but also a play that reflected what the country was going through in the Thirties and the time leading up to war (in 1939). We see some of those stories on stage,” she says. Power says it’s a play that both men and women will enjoy as they see the women come together to forge a winning team, a history you cannot find in books. “It’s not taught and I think women deserve as much history documented about them. It’s my job to put these stories on the stage so we can learn to empower young women and young men,” she says. When “Glory” runs April 4 through 13, Gateway offers events such as speakers and specials such as a ticket-and-wine combo, where with the purchase of four tickets comes a glass of wine and saving of $5. Contact Richmond’s Gateway Theatre for tickets at (604) 270-1812.